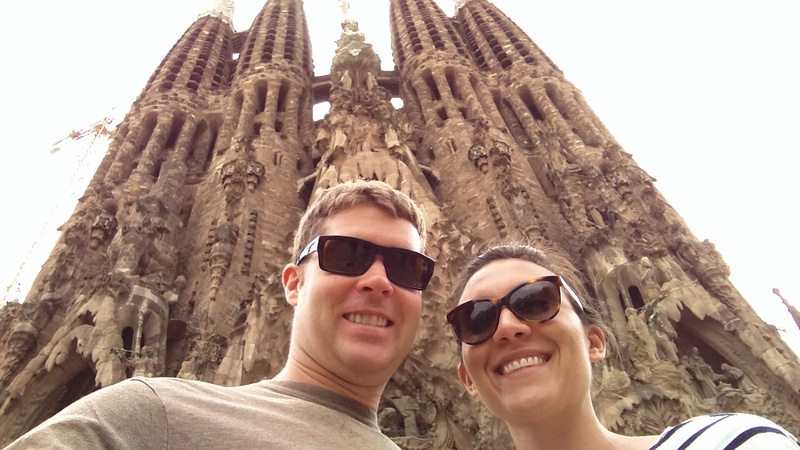 We made it to Espana! And to warmer and dryer weather!! 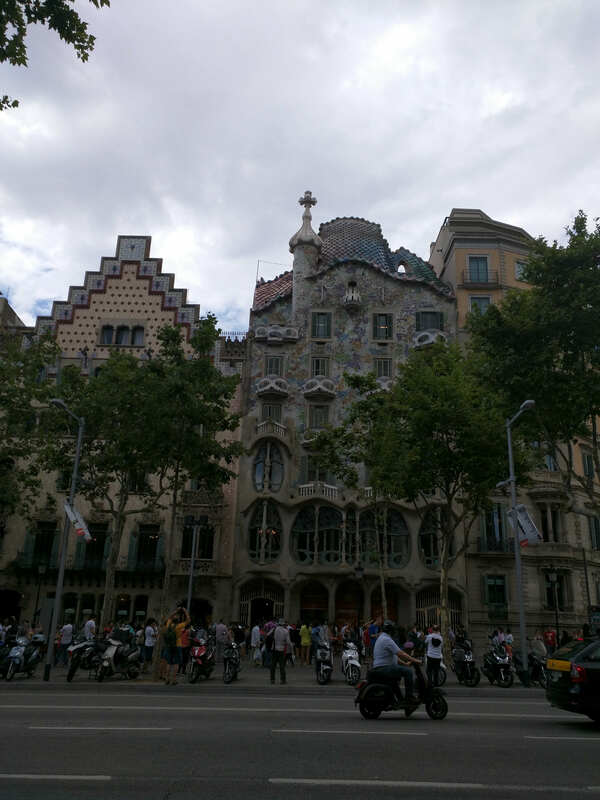 Our first stop in Spain is Barcelona and it is amazing. 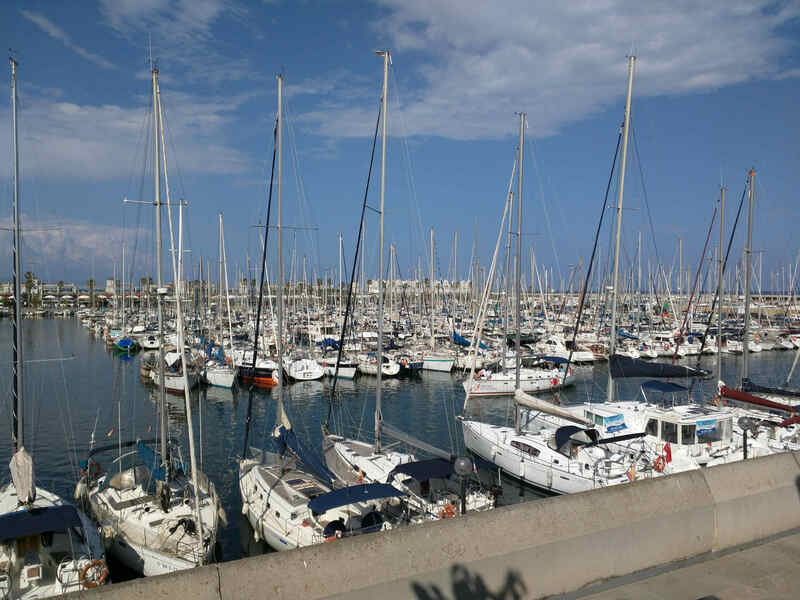 We stayed in a really cool neighborhood, Poblenou, that reminds me of River North in Denver. 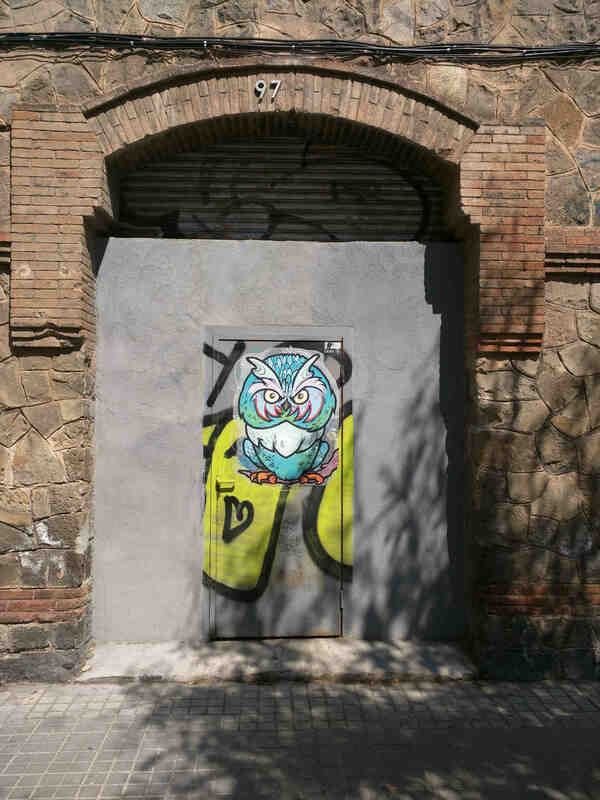 It is really industrial with a bunch of coworking spaces, neat restaurants, and art studios. We went to a coffee shop, Nomad Coffee Productions, that actually roasts their own beans. No offense to the Spanish but I love me a light roast coffee instead of the super dark espresso that the spanish love. So it was nice to get a cup of coffee like that. Dan and I actually got interviewed by Barcelona TV while we were there because they were doing a special on the coffee shop so who knows we might have been on the spanish news! 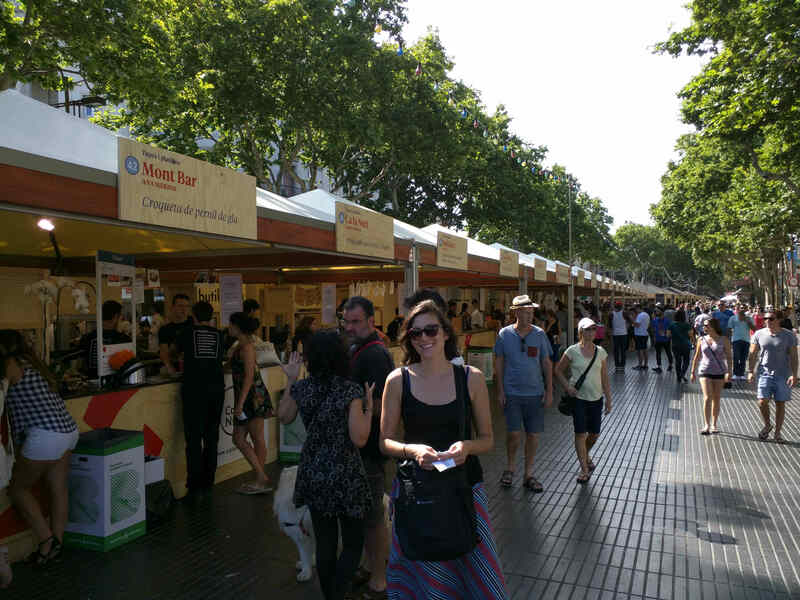 The first day we were in Barcelona we stumbled across an outdoor tapas festival which was a really great accident. You purchased tapas tickets and then each restaurant that participated made one tapa. They were delish and a great way to try a bunch of tapas. My favorite tapa was a squid ink risotto..yummy. Also hilarious was how you could buy beer tickets but if you bought wine/cava tickets (P.S. I’m in the land of excellent bubbly..aka cava. Yippee!) you had to buy a wine glass, apparently the Spanish do not approve serving vino in a plastic cup. Also while in Barcelona we discovered the spanish lunch. This lunch does not occur until 2pm and consists of 2 courses, dessert, bread, and depending on which restaurant you are at any drink you want (wine/beer included). Oh and I forgot to mention this comes at a price of 11-12 euros. So needless to say Dan and I got ourselves into a few spanish lunches where we had a bottle of wine to share, after dinner drinks, and coffee. Oh and I also realized why the Spanish need a siesta..who can drink a bottle of wine at lunch and continue to function without a nap?? So because we are horrible at napping we ended up walking the entire city of Barcelona and taking in the scenery along the way. 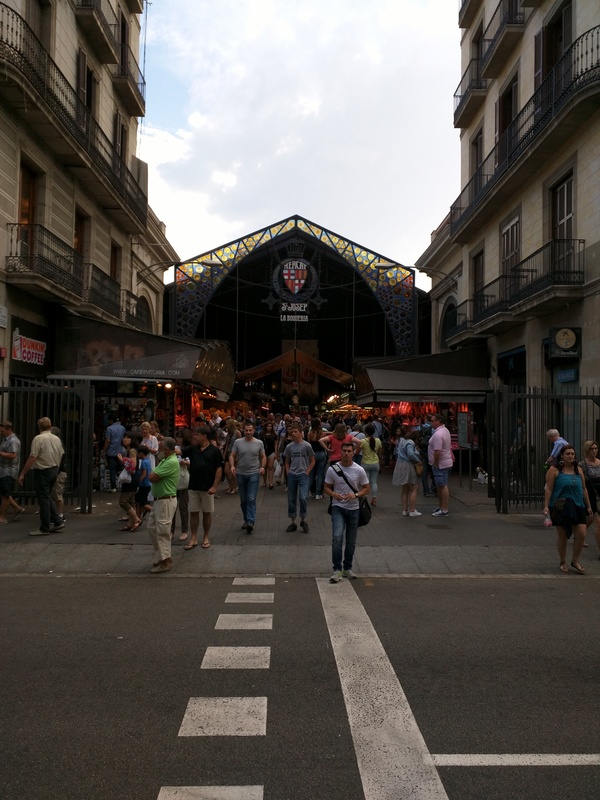 Barcelona has a few markets but the most famous is the Boqueria Mercado which is a foodies paradise. So many delicious veggies, fruits, meats, and charcuterie. And by charcuterie I really only mean ham..pork..pig..more ham..the spanish are super fans of pork and you can totally tell by the markets. 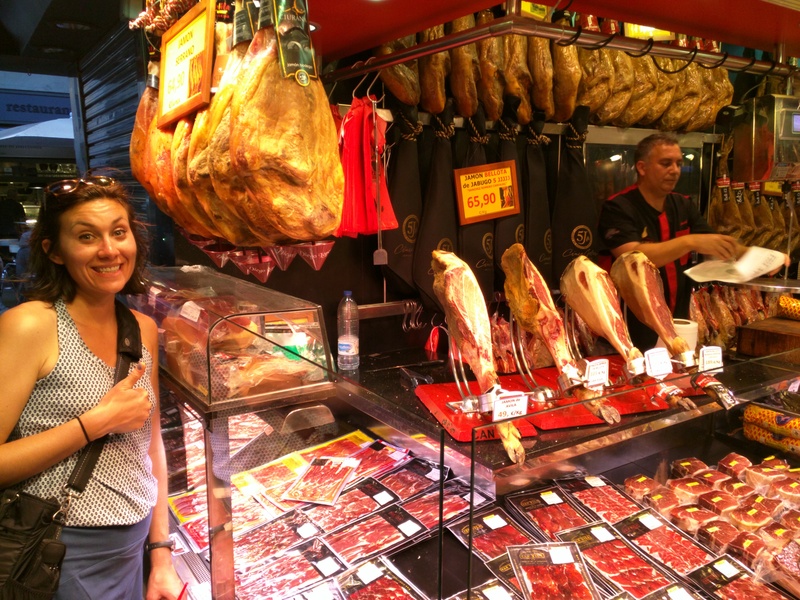 Legs upon legs of jamon..oh and every time we go to the market I basically have to drag Dan away and take all of the money so he doesn’t escape with an entire leg. I’m still trying to talk him out of buying one and just “strapping it to his backpack.” We made ourselves a bomb cheese, meat, tomato, and wine dinner after our smorgasbord extravaganza at the market. 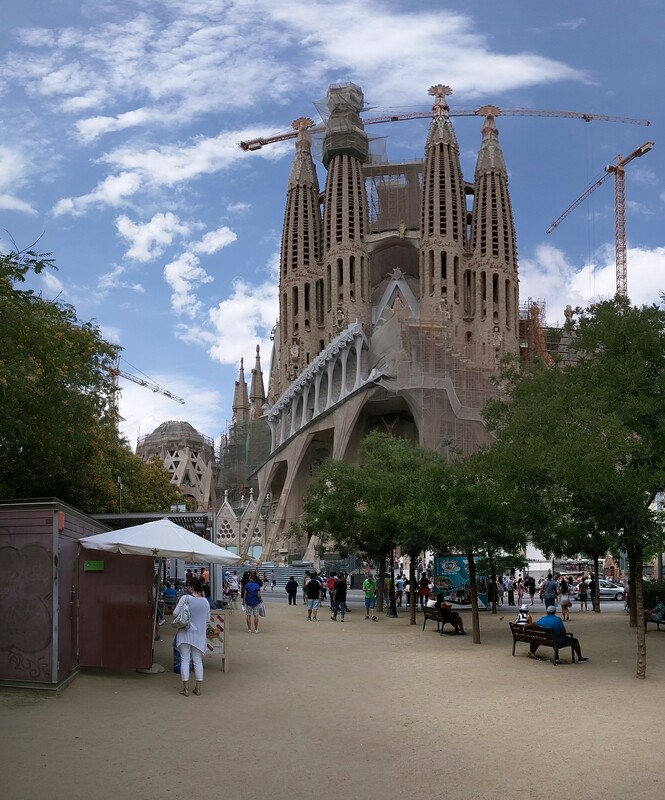 Also probably one of the most famous sites in Barcelona is the Sagrada Familia which is a huge cathedral, chapel, palace, castle (not sure exactly what to call it) like building designed by Antoni Gaudi who also designed a few other buildings in Barcelona and is an extremely famous architect. 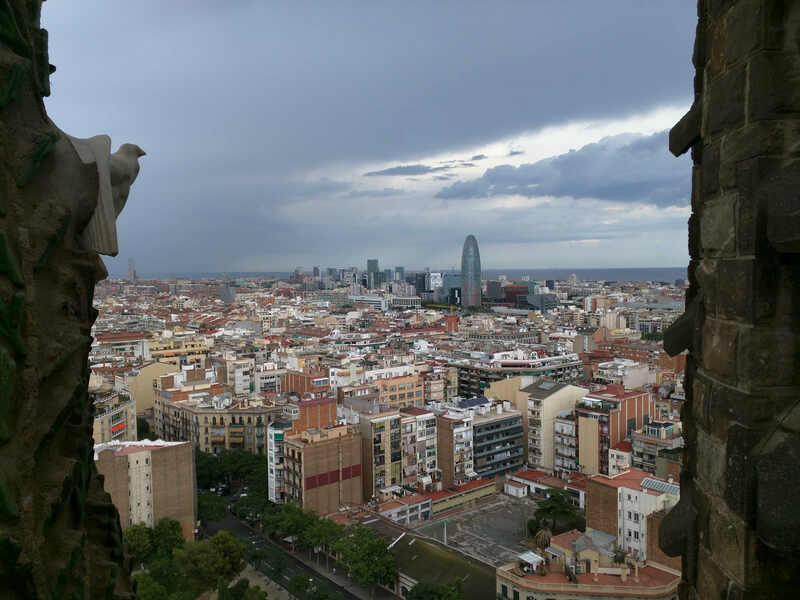 If you go to Barcelona you have to go to the Sagrada Familia and go inside. It’s unreal and it’s still not finished. This castle has been under construction for at least one hundred years and won’t be finished until 2026 (or that is what they say now). 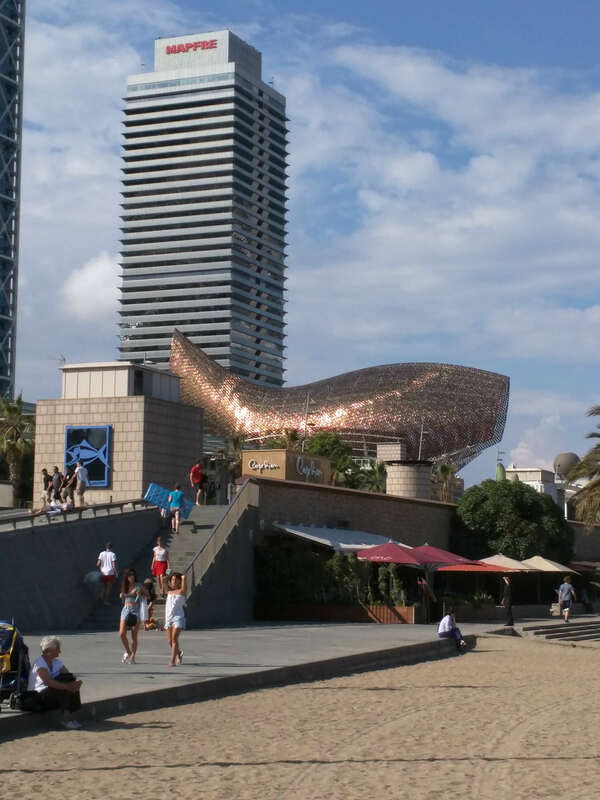 Barcelona is the home of 28 Michelin Star restaurants and 4 have two stars which is a lot. So that goes to show how bomb the food in Barcelona is! We had to splurge and try one of these restaurants. 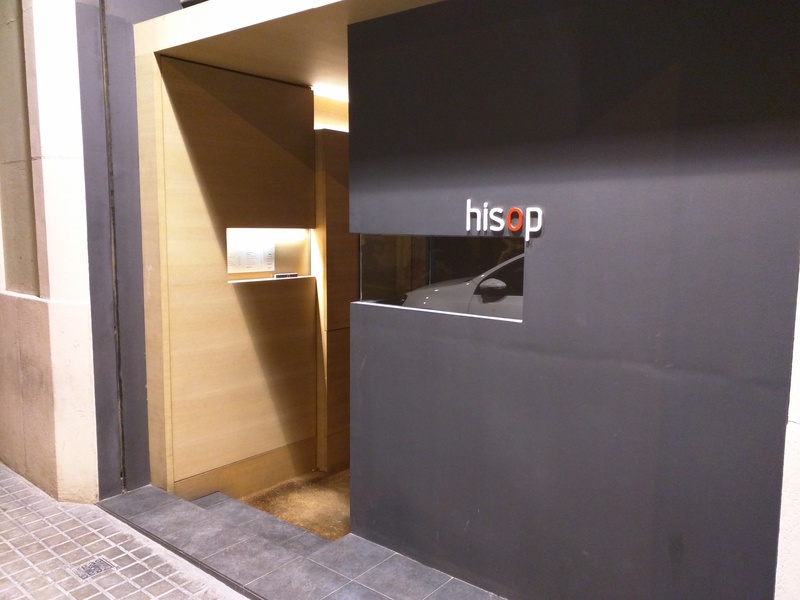 So one night we went to Hisop which is described as “Contemporary Catalan Cuisine”. They also have a tasting menu with wine for 90 euros so that was a bonus too. Some standouts on the menu were mussels with green curry broth/foam and the dessert which was an olive cake with strawberries and strawberry gelato. The dinner was overall really creative and we had some dishes I’m sure we won’t get to eat again. 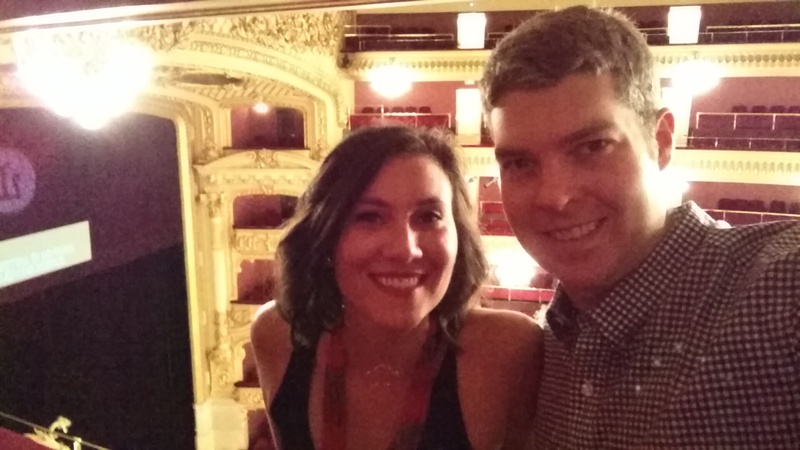 Since we were getting all cultural in Barcelona we decided to see an Opera at the Gran Teatre del Liceu. The theater is gorgeous and the opera, Don Pasquale, was in Italian with Catalan subtitles so we didn’t really understand what was going on until we googled the play and then still didn’t really get it. The opera was way more casual than we are used to seeing in the states where everyone dresses up and makes a night of it. People weren’t really dressed up and they packed their own dinners and brought it with them. So definitely a different experience than we were used to. We also went to see the Olympic park while in Barcelona. Its a cool thing to catch if you have time but definitely not a must see. It was fun to hike around the open gardens and run into a super techno music fest..
Olympic Park Fountains. Kristin looking really cool again. Oh and that is not even all we did while in Barcelona…more to come on Montserrat and more Tapas!! amazing ,,, just amazing …cant wait for the next installment of yalls adventure !! !